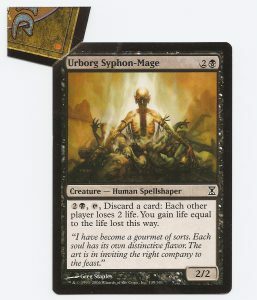 Editor’s Introduction: In this week’s Magic Oddica TheMisprintGuy expands on last week’s introduction of cards with extra material, and moves on to look at some radical cards with very unique extra material attached. Check out Chapter XV of Keith Adams‘ Magic Oddica to learn all about these unique collectibles! Some misprints truly are unique. This week’s example truly defines that. In continuation of last week’s theme, I wanted to share with you another card that can be simply explained as another card with excessive card, but I want to explain how something like this can happen. I’ve mentioned before what an uncut sheet looks like, you have cards on a sheet lined up approximately 11 x 11 side by side, and then about 1/2” or so of white trim that gets cut off and removed. In the case of this misprint below, the card is located in the upper corner of the print sheet. Before any printing took place, the corner of the sheet was folded over. With hundreds of sheets printed and stacked, this could easily be overlooked. After the printing, it was cut, and luckily the folded over area was barely held intact, leaving this “tab” on the card. Because of the white area underneath, this shows the accidental folding of the sheet took place before any printing took place. And due to the shape of the uncut paper coming to a point, it is only logical it is a top corner. It takes some thinking through, but I’ve come to the conclusion that this is the only way this card could have ended up like this. There are other examples I have seen of these. Each is unique and different, but the simple reason why this can happen is a sheet corner gets folded over accidentally before the printing process takes place. Many are caught and discarded, but no matter how thorough you are some will always slip through. The scans could be a bit confusing, so seeing this card being held, folded, and explained on video may be a bit more comprehensive and complete. 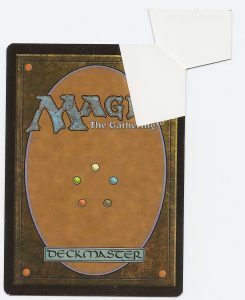 Next week, I will be sharing with you a foil card that is just randomly missing letters, and you easily could own one and simply overlooked, so stay tuned!